Fast forward two years. Two years that I ignored this market -- because they didn't want freelancers, right? Last week I ran into the magazine's editor and she mentioned a writer we both know coming to work for the magazine. When I replied that it would be a good thing for the magazine since they didn't like working with freelancers she looked at me like I had two heads. "What we really need is a freelancer who can come to us with ideas. Do you have ideas?" "Um...maybe. Can I get some together for you?" "Definitely. And I'll keep you in mind when we need a writer for an idea we come up with." Seriously? Seriously! Did I just waste two years because I took the words of someone (not the magazine's editor) on their relationship with freelancers? Was the magazine's editor standing in this hallway asking me to shower her with ideas and putting me on her to-call list after a five minute conversation? If you take anything away from this story let it be: pay attention to the no. Who is telling you no? Are they the final say? Even if they act "in the know" unless they have the word editor attached to their name their word is not law. How are they telling you no? Is it a firm, that's-not-our-policy no? Or is it a meandering, complaining no? Sometimes a no is more about something negative that happened recently than about the question you're asking. Did they actually say no? Or did you just hear no? Don't be afraid to follow-up (either in person or an email) parroting what you think they meant, just to make sure everyone's on the same page. And don't waste two years like I did! 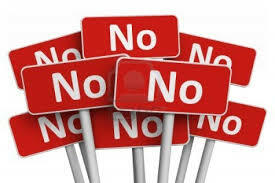 Have you ever written off a market or job because you mistakenly heard "no"?